There are three different variations of the Boeing 787 Dreamliner and as of 31 March 2017 all three are now flying. The Boeing 787-8, 787-9 and 787-10 are described in the table at the bottom of this page which shows the detailed specifications of each of the variants. As well as bringing large jet ranges to a medium sized jet, the Boeing 787 also matches the speeds of larger jets with a cruise of Mach 0.85. This is delivered with an environmentally friendly fuel saving in the area of 20%. Key to delivering this efficiency is a suite of new technologies. Weight is being reduced by the fact that up to 50% of the aircraft is built using composite materials, including the fuselage and wings. To put this in perspective, compare the Boeing 787 with Boeing’s current top selling Aircraft, the Boeing 777. The fuselage is constructed using single piece barrels joined end to end instead of multiple panels. This reduces the need for around 40,000—50,000 fasteners. Additionally it increased strength allowing for higher cabin pressures. The Boeing 787 carries self monitoring systems that are able to report to ground based computer systems on the state of health of the aircraft and its systems. One third of the efficiencies come from the new technology engines. Boeing has chosen two engines to work with; the General Electric GEnx and Rolls-Royce Trent 1000. Both engines move from the old Bleed Air systems of powering aircraft systems such as; air conditioning and start-up, to electrical, thus moving to a more electrical aircraft. This is weight saving as well as less of a power drain on the engines. 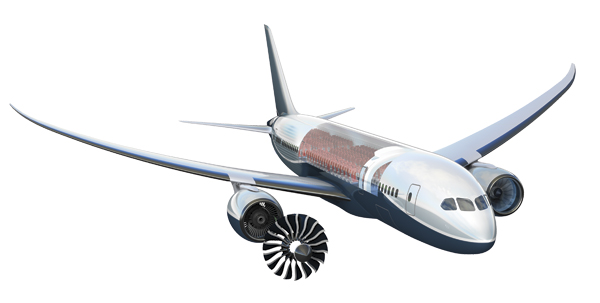 A pictorial representation of the materials used to construct the Boeing 787 Dreamliner. Both engine types have an identical interface allowing operators to fit either type of engine when required. The engine nacelles also feature chevroned trailing edges of the casing to reduce engine noise. For the first time Pratt and Whitney have not had a launch product, as it is believed they could not make the business case work to develop this kind of engine. An Active Gust Alleviation system, similar to the system that Boeing built for the B-2 bomber, improves ride quality. 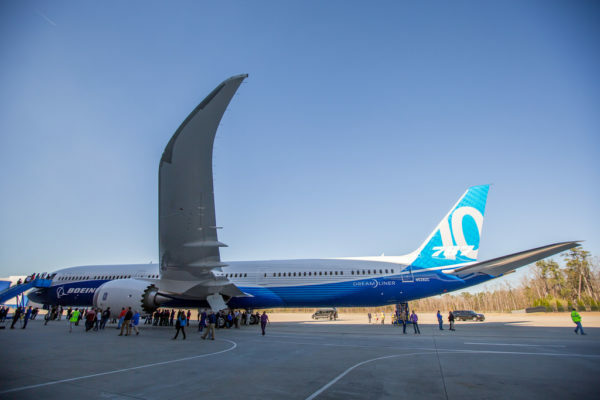 Boeing, as part of its “Quiet Technology Demonstrator Project”, experimented with several engine noise-reducing technologies for the Boeing 787. Among these was a redesigned air inlet containing sound-absorbing materials and redesigned exhaust duct covers whose rims are tipped in a toothed pattern to allow for quieter mixing of exhaust and outside air. Boeing found these developments made the Boeing 787 significantly quieter both inside and out. A special toilet has been designed to accommodate wheelchair passengers, a 56 inch by 57 inch lavatory has a movable wall so that two lavatories can be converted to one to allow access. Boeing 787 Dreamliner wing comparison. Boeing 787 Dreamliner cut away. Cargo Capacity 136.7 m3 (4,826 cu ft) 28 × LD3 or 9x (88×125) pallets. 172.5 m3 (6,090 cu ft) 36× LD3 or 11 x (96×125) pallets. 191.4 m3 (6,722 cu ft) 40× LD3 or 13x (96×125) pallets. I was looking for some information on the problems associated with the B787-8’s (regardless they have addressed and corrected many problems) the fact remains this was the first commercial aircraft grounded in 35 years time, here in the United States. Those GE engines had dangerous problems one case in particular was an engine spitting pieces of metal out the rear of the engine, which in turn started a grass fire. Raw fuel leakage from the wings, which the passengers had observed before the crew did, because those on-board computers posted no abnormal condition. These fires occurring in the rear fuselage cargo sections was not because of an APU unit, or aircraft battery (like our news people had stated) The B787 aircraft do not use a typical APU everything is electrical. The cause of these fires was was due faulty batteries and poor routed connections, high amp batteries used to drive equipment like trim position for the elevators. These are NOT problems which have occurred nor have they been seen on other new aircraft and new engines. These are very alarming problems, fortunately nobody was injured or killed. Personally I wouldn’t fly in this technological hunk-of-junk, even if the faulty components get removed and replaced. We are going to witness more problems in the near future as those composites might well start “flying off” like the surface skins on the upper surface of the B767’s Meanwhile “pilots” are not pilots, they don’t fly the airplane, they are computer input operators; and human system monitors; be this a joystick or a yoke; the computers fly the plane. I prefer to have a pilot having “direct” control and not by direct law; alternate law, or backup law, as the Air France flight that when down off the northeast coast of Brazil, it clearly means neither of the pilots knew what was happening to their aircraft and systems; and neither knew how to fly it manually. If this is the type of aviation you like the may GOD be with you… I prefer rudder pedals, yokes, and direct control period. I understand where you are coming from. Aviation has come a long way, and I understand your argument about pilots being computer operators rather than stick and pedal operators. Your Air France example seems to have been repeated in the Air Asia A320 incident off Borneo where it seems the pilots were unable to recognise their situation, nor were they able to exercise some basic procedures to recover from the situation. I hope that the aviation industry takes note and implements appropriate training and refresher training to their flight crews to revisit some of the basic principles of flight. With regard to the new technology, and maybe this is part of the problem above, a case of TSTH, Technology Smarter Than Human. Pilots have to work with so many new systems and while that is in place to make things safer for all of us, it also adds to the knowledge pilots require to carry out their jobs. In the rare case where things go wrong, and all the backup systems fail then the pilot has to step in and evaluate what when wrong and compensate or retrieve the situation. Knowing how to fly a basic aircraft plus all these new systems must be one hell of challenge. I guess over 99% of the time they achieve it. so those are pretty good odds. Whenever new technology is introduced to any industry there is always a time of testing and ironing out teething problems. Road blocks and hurdles appear in practice which did not seem evident on the drawing board. If you told Wilbur and Orville you were thinking about building a metal aircraft carrying 450 people they would have been rolling around on the sand laughing at you. Would you get into a wood and canvas 747? No, things have to evolve to allow future developments and improvements to happen. Remember the de Havilland Comet. It was a total mystery why they kept dropping out of the sky with monotonous regularity. The beginning of the jet age was our first introduction to metal fatigue and it enabled us to take that into consideration when designing future aircraft. I agree the 787 is still work in progress, and no doubt future events will require a rethink of some methods of construction. We have to keep moving forward, making improvements and learning from our mistakes. I hope you will have a great and safe flight on a 787 some day. Thank you for stopping by. I love flying a Piper Cub as well. But, much larger than that, don’t all types need assistance? not sure what you mean by assistance, but flying a tail dragger these days must be a rare thing. Great skills. As a line pilot flying the 787 since 2012 I’m still waiting for all the doom and gloom you are predicting. With ALL 787s currently in service and ALL the miles they’ve flown and passengers they’ve collectively carried can you give me some idea of when we might expect these calamities to begin ? BTW the Boeing 777 (which I flew for seven years) has a nearly identical flight control arrangement. Do you fear it as well ? Hi Hugh and thank you for taking the time to comment. I must go back and see what doom and gloom I have written. If that is how I have come across, forgive me and I will be changing it. I haven’t been fortunate enough to fly the 787 yet, but you can bet I will be excited when the opportunity presents itself. Happy flying. Hi Tialaita and thanks for stopping by. Absolutely pilots know how to fly. I have nothing but respect for our men and women who criss cross the sky every day with the lives of hundreds in their hands. To me it is still one of the most noble professions. I don’t compare myself to them when I say I have done private flying in my past and watched some of mh instructors go on to be 747 pilots. I envy you having flown on the 787-9, something I have yet to do. Up up and away. 787s have an APU, right up in the aft fuselage. and no aircraft has the capability to detect a fuel leak from the wing, that is what is referred to as an ‘Observed Fault’ where the aircraft maintenance computer does not give any information. Most of the time pilots do not know, they’re not looking at the wings! so yes passengers could see it first. That’s where good old fuel management logs are essential. Tracking how long fuel is used from each tank helps to spot anomalies before leakage problems get out of hand. Fuel starvation can still happen, as found on Air Canada Flight 143, know as the Gimli Glider. Also Air Transat flight 236 which made a successful gliding landing in the Azores. Quick! someone hand the ropes to little pepe, the burro standing outside the door waiting to take quadcomputers to his destination! I’m sure he will get there safe! if he doesn’t get run over! or bitten by a snake! or mugged by who ever might not like the looks of him, or who knows what! Funny how some people just don’t realize that machines are machines and guess what? ALL machines are made by humans! oh and in case you didn’t realize, human error is an EVERPRESENT issue that will happen at the least unexpected moment! Yes, things go wrong, but that happens on EVERYTHING in this life, I guess quadcomputers must be under the impression that pilots took their flying test last week and that was on a Cessna172. I’ll fly the 787 any time, any day, anywhere! oh and if it falls, well, I’ll just have to enjoy the last ride! : ) but somehow, I just don’t think I’ll ever have to do that! it could happen, but more than likely… nope! an interesting perspective and one that we do lose sight of in our computerised world. I totally get the burro analogy. Our advanced technology is often dependent or governed by seemingly unrelated historical traditions. It reminded me of why the Space Shuttle side boosters are the diameter they are. The story goes back to makers of the railways and Roman carriage widths. In short the rockets had to fit through railway tunnels that were the width of two horses behinds. Humans certainly are fallible and we certainly understand and appreciate that. To ensure that this fallibility doesn’t translate itself into our important technology such as flight, backup systems, double and triple checks are put in place to ensure nothing slips through the net. Over time lessons are learned from events that slip through the system and as a result new systems or improvements are put in place so that the particular event can never reoccur. No accident occurs without it providing valuable data toward the prevention of future accidents. As a result, flying has never been safer. At any moment thousands of aircraft are aloft safely transporting their payloads from A to B. Very impressive and a demonstration that another technology is coming of age, the electric car. That is indeed strange. Perhaps one of our readers may be able to help you with that. Thank you for stopping by. I am working as technician in airport for the maintenance of fixed electrical ground power unit(FEGPU). Once the Qatar dreamliner (787-800) utilized power from fegpu during standby. While starting the plane after completion of boarding, the engines did not cranked by using our fegpu. We had connected three 90 kVA power cables (two near front landing gear, one at aft wing side by). Rear side we used mobile gpu of same power output i.e., 90kVA. But the plane engines did not started. After changing of front NATO fegpu cables with mobile gpu cables, one engine got successfully cranked. The flight AME made a statement the “FEGPU is not delivering the required power to aircraft”. Maximum power had supplied by the fegpu during standby without tripping; during starting also huge amperes were loaded on our fegpu. Then what is the reason for engines not getting started while connecting fegpu….???? After that flight departure, Emirates 777-300 utilized the power from the same fegpu and same plugs and this flight cranked the engines by loading on our fegpu….!!!! No fault log observed from fegpu side. I somewhere heard that B-787-800 should be cranked only electrically from the aft side receptacle by connecting 90 kVA input. Is that correct….??????? the aircraft’s operations-pass comfort and safety! There is one major point being over looked, IT’S MAINTENACE! Some day after said aircraft’s start to acquire more than 10,000 cycles of flight it will be maintenance’s( Engineer’s, Quality Control/Audit QC/QA, and others )task’s to maintain these aircrafts in an airworthy state to transport the citizens of the world SAFELY! The road Boeing( Other’s I hope )is taking is more than just Clean with the Dreamliner, it’s also taking aim at the Human Factor in aircraft maintenance, I Have 40 year’s in quality control and engineering in aerospace and I’m now retired. Maintaining aircraft’s require thousand’s of specialist’s working behind the scene to achieve this level of safety( redundant aircraft system’s have limits )that the general public does not see until a major event take’s place, there is a Technical revolution taking place in aircraft design and I for one welcome it! P.S. from the Wright Brothers to today aviation has been a work in progress so be patient with worlds designers. You’re so right. Safety through thorough maintenance is what keeps us all flying safely. We take this for granted unfortunately, I guess because we don’t see it. Is great to get your perspective on how the Modern Airliners stack up from a maintenance perspective. I’m sure Boeing, Airbus and others give a lot of consideration to maintenance procedures and how to keep their birds in the air as long as possible. The airlines need their shiny investments to be flying as many hours a day as possible. If the engines ain’t turning, it ain’t earning. Hi, Noticed the specifications on the table does not match with the ones found on boeing ‘s website. (ie. the range,seating, etc). Any reasons for the discrepancies or is boeing’s website not getting updated? thanks for noticing. These have now been updated. The 787-8 specs need to be updated since we now have the commonality fix. 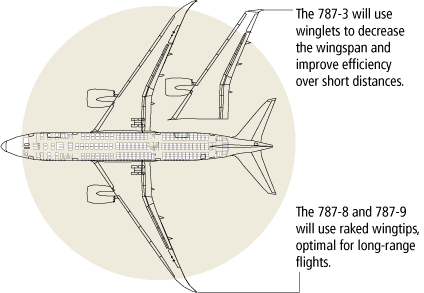 The 788 will get the same larger wing and laminar tail as its bigger siblings, and that means extra fuel and range. Hi and thanks for checking us out on this. These should now be updated. I love this discussion. Sadly I am not a pilot so I just had to do the reading without contributing to such a great topic. But I must say this whole discussion is quite inspiring. Reminds me of how I used to tell everybody I wanted to be a pilot upon growing up. So sad that did not materialize, but I love everything about aviation, could be I am not too old to be one. I was wondering what source you found for the material content of the airliners. I am currently doing research on the aluminium stock in aircraft and would love to hear where you found these figures. I use a variety of sources on the internet, from the manufacturers themselves to other sites. This way I can cross-check the details to make sure the manufacturer is not upping their product too much. Sometimes I am lucky enough to find actual manuals with a lot of details. thank you for stoppping by. Can I suggest searching for 787 schematics, I’m sure there will be something there for you.